Can the Holy Grail of the Geosynthetics Industry “Zero Leakage” be Achieved? To answer it very shortly in one sentence we’d say following – The sum of Arc Testing (SENSOR DDS® MIT) with Dipole Testing (SENSOR DDS® Mobile) or Permanent Monitoring is greater than its individual parts. This seemingly incredible statement is backed by analysis of results from a sample size 6, 820,020 m2 and also by the analysis of the Arc Testing method contribution to overall leak testing methodologies. Lets have a look at it closely. Progressively from 2009 – 2016 and in different countries (several within EU and Turkey, Chile, Bolivia) and in different geomembrane applications (water ponds, municipal landfills, process ponds, leach pads, storm ponds, green roofs ect. ) 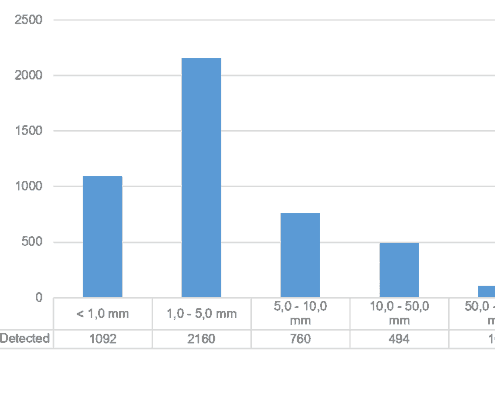 we took the data from completed surveys for our “Sensor Zero Leaks statistics” covering nearly 5,000,000m² on a variety of geomembrane types (HDPE, LLDPE, PVC, PP, fiberglass, PU, liquid coatings, bituminous membranes, etc.) and over many different thickness from 0.6 – 5.0mm. The results far exceeded our expectation. More than 4 700 holes were detected. Analysis of detected and located leaks categorised by their cause. Total sample size was 6,820,02m². What is incredible looking at the data is the realisation that without arc testing how many holes must stay undiscovered, creating potential places for leaks and contamination, or loos of production material. Size of leaks vs type of ELL method. The result is 6.98 leaks per Hectare. In this case the both the Arc Test and Dipol method are compared. This comparison is linked through the sizes of detected leaks / holes so to be able to pinpoint their productive mutual complementarity. It should be noted that the overlapping area of size of leaks / holes (5.0 – 50.0 mm) is represented by diametrical opposing hole / leak types. In the case of Arc Testing it is mainly faulty seams and cuts in geomembrane. Whereas in case of Dipole method these are mainly tears and damage caused by heavy plant. The presented data is based on real results from surveys completed over a total area of 6,820,020m2 which represent 6.98 holes / leaks per Hectare. Further conclusions can be drawn from it as this shows the clear dominance of the Arc Testing method as a proportion of detected leaks which represents 92.98% of the 4,761 leaks / holes detected and located. The next conclusion is that the holes sized from 1.0mm to 50.0mm are predominantly found by Arc Testing. On the other hand it is necessary to say that within the interval of 10.0 – 50.0mm the dipole method is equally good at detection of leaks. In this case this is represented mainly by serious damage like tears or general damage caused by heavy machinery. Also it should be noted that, leak size interval of 1.0 – 50.0 mm by its very nature covers the majority of emerging breaches in the liner . The aforementioned interval represents 94.64% of all leaks detected and located within the survey analysis. This clearly confirms that the dominant quantity of leaks are created during the geomembrane installation period and within a time period when the geomembrane is not yet covered. So far we could only intuitively think about it, but now we have very clear tangible evidence of this incredible issue. Of course on other side this is confirmation of the necessity of use of ELL methods to control the integrity of geomembranes after covering and in the end to have sites free of leaks. Again we can authoritatively state based on results above that the Arc testing method creates a logical pairing with the Dipole method. This presented article highlights the indispensability and suitability of the Arc Testing method for exposed geomembranes and its application before being covered. The assumption that the Dipole method is enough to detect and reveal every hole / leak including the ones described above detected by Arc Test is wholly incorrect because the principle and character of the Dipole method does not enable it to detect such geomembrane damage. 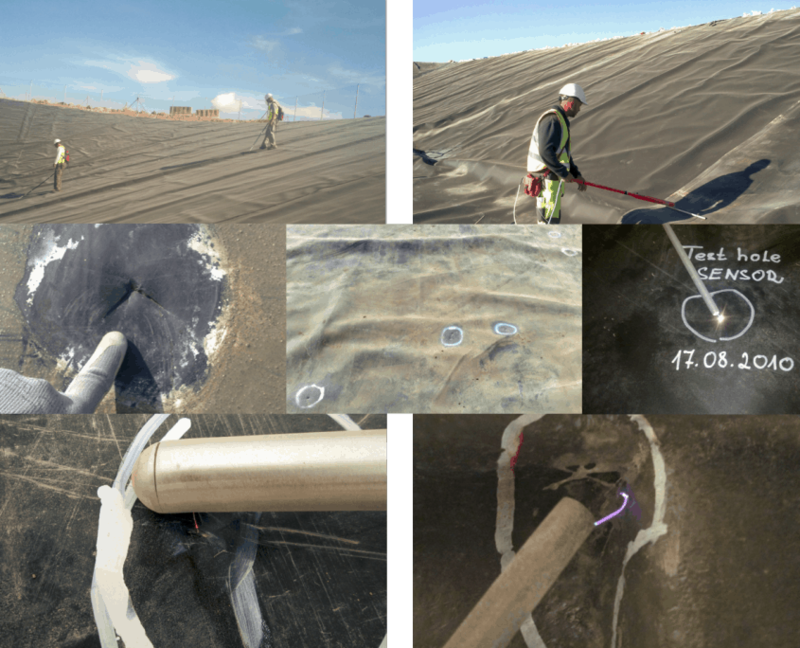 Notwithstanding that the combination of Dipole with Arc Testing significantly moves meaningful ELL work to the pinnacle of a “Zero Leak” geomembrane installation. The Arc Tester under appropriate boundary conditions is able to detect 100% of all existing leaks in exposed geomembranes and the Dipole method contributes through the detection of leaks created during subsequent processes such as placement of drainage and protective layers on top of geomembrane. This is extraordinary and productive combination of ELL methods. In fact similar findings were published by authors Forget, Rollin and Jacquelin (2005), whose analysis reached similar findings but based on water based method applications along with Dipole application. The clarity of need for such a unique combination of testing methods (exposed geomembrane testing and covered geomembrane testing) and creation of one logical set for achieving leak free installation is documented by Beck, A. (2012) whose paper describes the application of a conductive geomembrane tested by spark test and followed by Dipole method after covering, showing that in this combination of ALR 0.00001% can be achieved.